Dusty garnet color. Aromas and flavors of ripe bing cherry, dried cranberry, menthol, leather, and roasted beets with a satiny, bright, fruity light-to-medium body and an even, medium-length finish that shows nuances of grilled tangerine, chocolate pastry, and dates with dusty tannins and moderate oak flavor. An earthy yet fruity Italian red that will work well at the table. Bottom Line: An earthy yet fruity Italian red that will work well at the table. 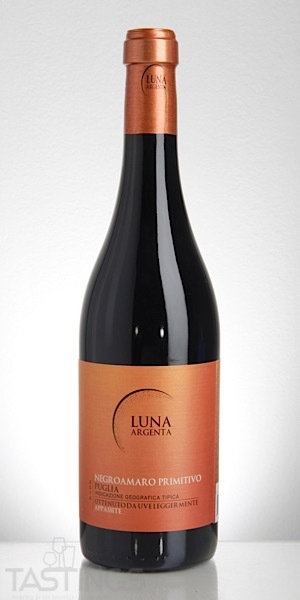 Luna Argenta 2016 Appassite, Negroamaro-Primitivo, Puglia IGT rating was calculated by tastings.com to be 89 points out of 100 on 12/4/2018. Please note that MSRP may have changed since the date of our review.